I've been looking at EnGenius products for a while, but I've not yet bought one for testing. EnGenius, also known as Senao in some parts of the world, is well known for making high powered long range access points, for both indoors and outdoors. Fortunately, a friend got an ECB-3220 for one of his projects, and I borrowed it off him for testing. The ECB-3220 is a high-powered access point with 400mW RF output and bunch of other advanced features such as WDS, SNMP, virtual SSID, etc. 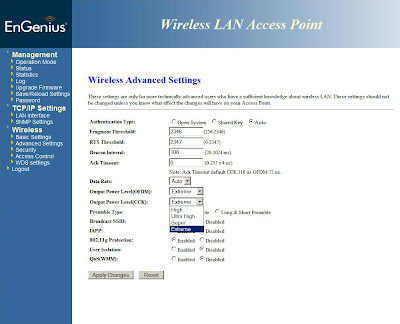 Of course, all those advanced features can be had for free with DD-WRT. The only things I want with the EnGenius is the higher power output and PoE. 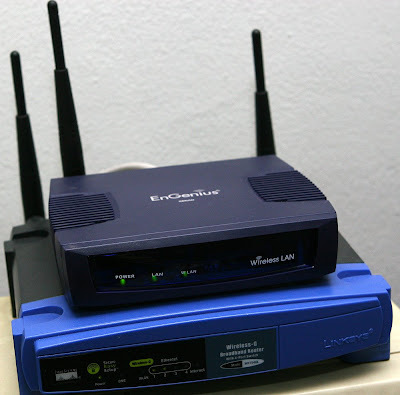 The body of the ECB-3220 is well constructed, and smaller than the standard Linksys WRT54GL. Which is to be expected, since the WRT54GL is half empty inside. 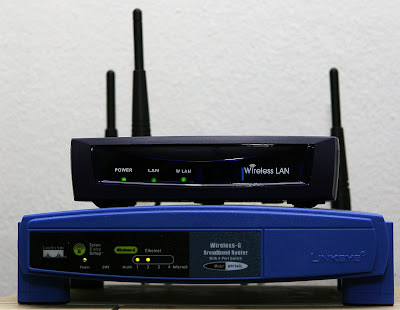 The WRT54GL only remained that size to be compatible with older Linksys products and mounting frames. Unfortunately, when I set it up for testing, it didn't seem to perform any better than the WRT54GL I have stacked below it. I kept getting the exact same signal strength level no matter what I tried. The ECB-3220 also has the same female RP-TNC antenna connector as the WRT54GL, so I also tried swapping antennas and changing orientation. I also have an ASUS WL-500gP (not pictured) which seems to give even better signal. After some head scratching (and secretly glad that I didn't buy the more expensive ECB-3610S 600mW version for testing) I realized that the output power level options in the advanced wireless setup page has four values: High, Ultra High, Super, and Extreme. I had seen the options earlier but didn't change them because the default value is "High", and I thought it would default to the highest output value. Once I set the output power levels to Extreme, everything worked as I had expected, I could get approximately three times the range of the WRT54GL when indoors. And when outdoors, I could go all the way up to nearly half a mile away. Testing was done with my ASUS EEE PC 701 with the Atheros wireless chipset. Looks like I need to buy the ECB-3610S after all. I'm on a firmware upgrading spree here. Right after upgrading the Buffalo TeraStations yesterday, today I see that DD-WRT has also had a newer release. This might be currently available for paid customers only, but DD-WRT is worth every Euro cent. Strangely enough, I found that my Linksys WAP54G access point (DD-WRT micro) wouldn't take the upgrade eventhough the firmware loading seemed to work. After trying a few times, I realized that the firmware did transfer correctly to the access point, it just didn't reboot at the end. I tried manually clicking on the "reboot" button, which made the access point go through the reboot motion, but it still didn't actually reboot. I ended up having to go to the access point and unplug it. When it booted up again, it became v24-sp2. Since deciding to move on to Windows Server 2008 (x64), I've been downloading drivers and studying docs to prepare for the install, and then I saw this - Buffalo storage devices having issues joining Windows Server 2008 active directory. The update went differently this time than before. After TSUpdater performed the firmware transfer, instead of rebooting, my TeraStation shut down and TSUpdater complained that the TeraStation can not be found. That scared me for a second since my TeraStations are long out of warranty. But after manually powering up the TeraStation, the firmware update proceeded to do its job and everything was well. 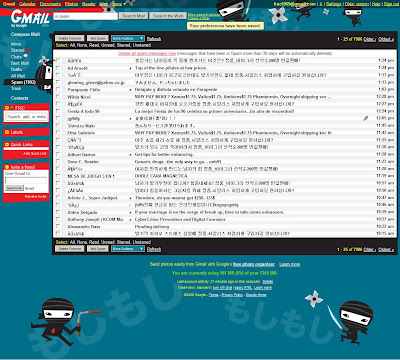 I opened my Gmail this morning and suddenly noticed it was a deeper shade of blue and some of the icons seemed to look different. Just to prove that I wasn't imagining things before my morning coffee, I opened my company's Google Apps mail, and sure enough, Gmail now has themes. Very cool. On a completely unrelated note, I've been having a lot of trouble searching for stuff using Google. It always complains that the request looks like it's from an automated robot. I wonder if this is related to the great firewall of Thailand. In Thailand, with the longest commuting times in the world, a total of 37 million hours is spent travelling to work everyday. If this number is doubled the total time commuting each day in Thailand can be calculated. The average working person living in Thailand spends 2 hours everyday travelling to and from work. The shortest journeys to work are in Malawi, taking just 2 minutes. I wonder if there are any job openings in Malawi? Oh my, I wonder if we're actually going to get a 3G network, only about a million years after it's promised? Or if they're going to pretend that their city-wide Wi-Fi network is 3G? 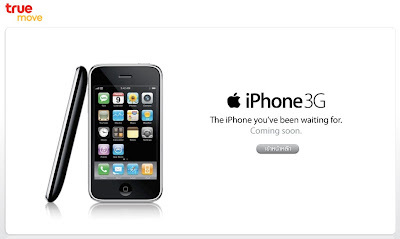 I also wonder how many they're going to pretend to sell, since the iPhone gray market here is huge. True Move is the third largest (out of four) cellular provider in Thailand and I happen to be a user. I used AIS (largest cellular provider in Thailand and owned by the former Primer Minister) for many years until one day they suddenly changed the GPRS service charges. GPRS in most places (all?) of the world is charged by the number of bytes transferred. AIS suddenly changed it to be charged by the minute. Their reasoning is that to download ringtones, it's cheaper to be charged by the minute than to be charged by the number of bytes. They also thought they could change it without informing anyone since there were practically no GPRS users at the time. I racked up a humongous bill since I always left my phone logged in to one of the instant messaging services. That iPhone guy's huge AT&T phone bill is nothing compared to my phone bill. I've long been a fan of William Stanek's technical books. (Can one really be a "fan" of technical books?) Unfortunately, I've never actually owned any of his books until not long ago, only recommended them to others. Late last year, my company embarked on a huge and expensive project to replace our aging ERP system with a new one, so I decided to take the opportunity to also replace our slightly aging servers running Windows 2000 Server with new servers with Windows Server 2003 R2 x64. I didn't actually have any extensive hand-on experiences with Server 2003 at the time, so I took the opportunity and ordered Windows Server 2003 Administrator's Companion (2nd Edition) and Stanek's Windows Server 2003 Administrator's Pocket Consultant (2nd Edition). The bookstore only had the 1st Edition of Stanek's book, so I placed an order and it took them three months to get the 2nd Edition in. Actually, when spec'ing out the new servers, I wanted to go with the then newly announced Windows Server 2008 (previously known as Windows Server Codename "Longhorn"), but since we already had unused licenses for Windows Server 2003, my boss didn't want to spend any more money for licenses, plus 2008 wasn't actually released yet at the time, so I figured 2003 R2 was good enough, and we could upgrade to 2008 in the future, like when SP1 comes out or something. Unfortunately, our ERP project got incredibly delayed due to unforseeable circumstances, and the new servers I put together for the ERP software were just sitting there gathering dust while I studied the documentation and did test runs. In hindsight, I should have put the servers into production use right then, but I wanted to start fresh all at once, but of course I didn't realize at the time how much the ERP project would be delayed. Fast forward to last month, and my dust gathering servers silently passed their 1st birthday, still unused, and suddenly my boss walked into my office and told me to go ahead and present a budget to him to upgrade to Windows Server 2008. 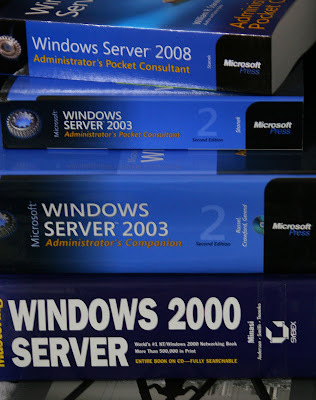 My unused Windows Server 2003 licenses and books! Eventhough I've studied the books extensively, it's not like they were actually put into any kind of "production use". But of course I took the opportunity this time to buy Stanek's Windows Server 2008 Administrator's Pocket Consultant , as well as put in an order for Windows Server 2008 Inside Out . 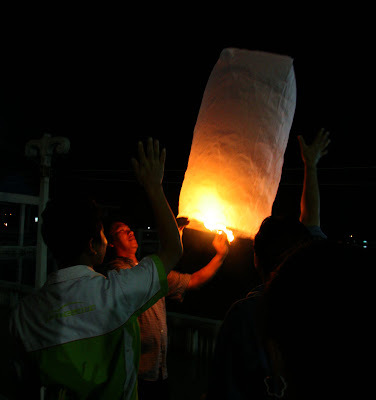 Yesterday was Loy Kratong Festival. It falls on the full moon of the 12th month in the Thai Lunar Calendar, or the full moon of the 10th month in the Chinese Lunar Calendar. Due to political unrest, the crowds appear much less this year, the Prime Minister even issued a bomb warning to the public to warn people away from crowded places. The crowds do seem to be a lot less than previous years, but still a lot of people went to the rivers to let their worries float away with the kratong and to pray for prosperity in the upcoming year. I didn't take many pictures this year because it's so dark. 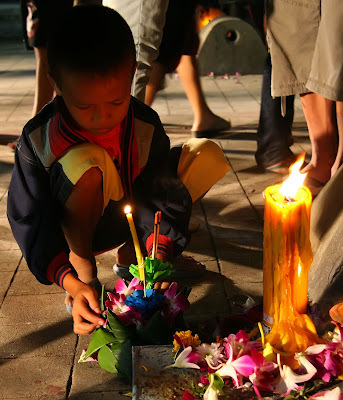 (It was so crazy windy the kratong's candles couldn't stay lit.) And to keep this post on topic for this blog, I prayed for no server problems in the next year! Recently, someone called me up to go check out their system since they were having a strange problem logging into the domain: some users can only login to the domain if they first turn off the refrigerator. 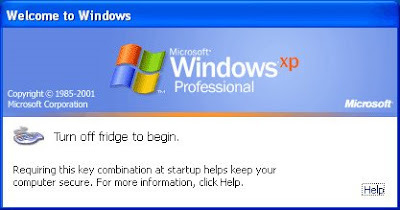 Every time these users turned on their computers, they need to turn off the fridge, login, then turn on the fridge again. (?!?!) It's normally not a problem, but the fridge got fried several times from being tuned off and on so much. When I arrived at the site, I sat down at one of the problem users' computer and wondered immediately why their domain name ends in 0. (The domain name was their company name + "0".) It seemed weird to give such a name to the domain, I figured maybe eventually they wanted to expand to have more than one domain, so they started out with 0. Later on when I looked at their server, I noticed the domain controller's hostname is actually the same as the domain name. Since the DC's hostname can not be the same as the domain name, Windows automatically appended a "0" to the domain name. And since the domain name doesn't actually contain the 0, some applications don't need the 0 to be typed in, and some applications do. Apparently the original sysadmin decided to name the server after the company, and name the domain as the company's name + ".com". But in a Windows domain, the ".com" would be removed and it ended up being a duplicate name. Even worse, the particular "company name + .com" that they chose actually exists as a real Internet domain name elsewhere. And what happened to the original sysadmin with the wonderful sense of humor for naming the domain after the domain controller and for randomly deleting users? Apparently he left the company and joined a high profile IT security and consulting firm. I'll remember to never hire any IT consultants locally, ever.